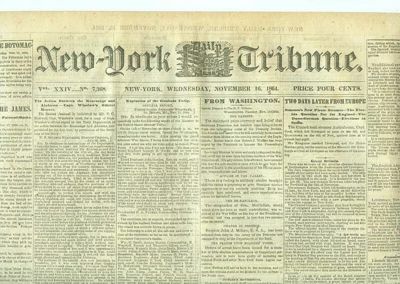 The New York Tribune was a major American newspaper on the 19th century, under the editorship (1841-1872) of founder 1841 Horace Greeley. It was the unofficial organ of the Whig Party and after 1855 of the new Republican Party. The Tribune was America's most influential newspaper from the 1840s to the 1870s and "established Greeley's reputation as the greatest editor of his day." Greeley used it to promote the Whig Party and after 1854 the new Republican party, as well as antislavery and a host of reforms. The paper appeared in daily editions for city readers. Its abridged weekly editions were read very widely by Republicans across the North, and helped shape the editorials of hundreds of local papers. It lost importance in the 20th century and was merged with the Herald to become the New York Herald tribune; it folded in 1967, but continues as an American paper published in Europe. Greeley prided himself in taking radical positions on all sorts of social issues; few readers followed his suggestions. Utopia fascinated him; influenced by Albert Brisbane he promoted Fourierism. He promoted all sorts of agrarian reforms, including homestead laws. The Tribune Almanac was an annual repository of political information and election statistics. Greeley supported generous policies towards settlers; he memorably advised the ambitious to "Go West, young man." A champion of the working man, he attacked monopolies of all sorts and rejected land grants to railroads. Industry would make everyone rich, he insisted, as he promoted high tariffs. He supported vegetarianism, opposed liquor and paid serious attention to any ism anyone proposed. What made the Tribune such a success was the extensive news stories, very well written by brilliant reporters, together with feature articles by fine writers. He was an excellent judge of newsworthiness and quality of reporting. When the new Republican Party was founded in 1854, Greeley and the Tribune became its unofficial national organ. It fought slavery extension and the slave power on every page. On the eve of the Civil War circulation nationwide approached 300,000. His editorials and news reports explaining the policies and candidates of the Republican Party were reprinted and discussed throughout the country. Many small newspapers relied heavily on the reporting and editorials of the Tribune. He served as Congressman for three months, 1848–1849, but failed in numerous other attempts to win elective office. In 1860 he supported the conservative ex-Whig Edward Bates of Missouri for president, an action that weakened Greeley's old ally Seward. Greeley made the Tribune the leading newspaper opposing the Slave Power, that is, what he considered the conspiracy by slave owners to seize control of the federal government and block the progress of liberty. In the secession crisis of 1861 he took a hard line against the Confederacy. Theoretically, he agreed, the South could declare independence; but in reality he said there was "a violent, unscrupulous, desperate minority, who have conspired to clutch power" –secession was an illegitimate conspiracy that had to be crushed by federal power. He took a Radical Republican position during the war, in opposition to Lincoln’s moderation. In the summer of 1862, he wrote a famous editorial entitled "The Prayer of Twenty Millions" demanding a more aggressive attack on the Confederacy and faster emancipation of the slaves. A month later he hailed Lincoln’s Emancipation Proclamation. ↑ Michael Emery and Edwin Emery, The Press and America (1988) 124-6.